Available in paperback on June 12, 2012. Engaging…wonderfully drawn. It’s worth noting that Christensen has somehow — again — created a captivatingly believable male narrator, although she can’t see 60 on the horizon, has not been married to a tempestuous Mexican woman for 30 years or published largely ignored poetry in academic journals. (Her previous novel, The Great Man, won the PEN/Faulkner Award.) And yet here she is doing what talented novelists do: creating a voice so rich with the peculiar timbre of lived experience that you feel as though she’s introduced you to a witty, deeply frustrated (and frustrating) new friend. 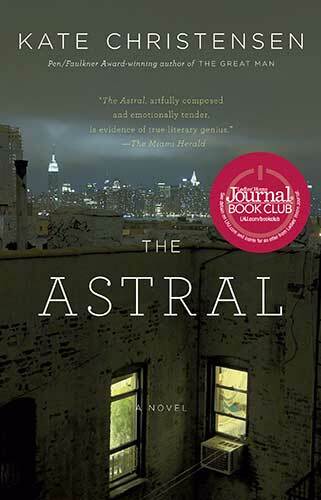 Just finished reading The Astral and loved it. As I was reading it, I kept telling my friends, “This book is so good. It’s so well written. I really like it.” Looking forward to reading more. All the best. I grew up on Calyer Street and lived in Greenpoint for 58 years; my family has been inthe neighborhood since the 1870’s. In my mind’s eye, I can visualize all the possible brick row houses you mention in The Great Man. I had friends that lived in the Astrals (all my friends and I always referred to it in the plural). We al hung out in Franklin Street park in the ’60s and ’70s. You seem very familiar with the area. Have you lived there? Yes, on and off for 20 years, all over Williamburg and Greenpoint. I lived on Calyer Street in a brick row house, and before that, in an old factory building on Metropolitan and Wythe, and before that, in a apartment on North Henry near McGolrick Park, and before that, above a Laundromat on Graham Ave. I love that you called it “The Astrals.” I wish I’d known that when I wrote the book. Thank you for writing.